As December, 2016, turns into January, 2017, Benjamin Percy, Otto Schmidt, Eleonora Carlini, Carlos Rodriguez, and Gus Vazquez, each decide to gang up on DC Comics’ most popular green clad hero. No. Not that one! The other one! The one without a ring yet has a goatee! Why are they doing this? Who knows? Although I suspect it has something to do with their new year's resolution! Man, Benjamin Percy is either a huge fan or has a serious bone to pick with the Seattle Seahawks. 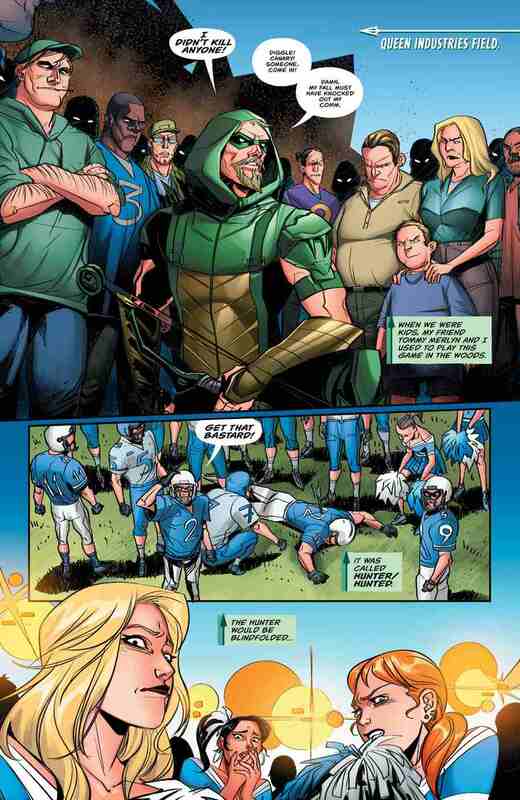 When he first took over Green Arrow, following the time-hop break after Convergence, one of the first things he did was to create and then kill off Eddie Ridge, a lineman for the DC Universe version of the real world NFL team. And now, well, we shan’t spoil too much, but all hell is breaking loose at Queen Industries Field, the DC analogue to CenturyLink Field, where our favorite shaft-slinger finds himself in quite the predicament. But that’s starting at the end, so let’s back up a bit, shall we? Right back to where issues 13 and 14 of Green Arrow turned into the second and third chapters of the six-part Emerald Outlaw story-arc. As per usual, Percy continues to weave multiple story-threads together so gracefully, that at times I feel like not much has happened since my memory sticks with the thread that hit a flashbang at the end of each issue. But, oh yes, so much has happened. I’m greatly enjoying the five intertwined stories in this tale; the Arrow Killer, Nathan Domini’s political campaign, Sargent Notting’s suspension, The Vice Squad, and, well, let’s include Henry’s whining, too. The first two threads of the Killer and Domini are clearly tied back in some way to Broderick, and thus, perhaps, what remains of the Ninth Circle. Notting and The Vice Squad certainly intersect one another, though we do not yet know if they involve Broderick. And then there’s the guy seen with Broderick at the end of issue 12, who may be a superior, or even a henchman. Percy works so many niggling little mysteries in between the big moments of the story that every re-read feels like it bears more reward. Schmidt’s art is growing on me more each issue. With thin, perhaps simple lines, he is able to bring some great expressions to the page, putting unspoken words where there aren’t any speech bubbles. This can be seen in the cop’s side-eyed glance at her partner’s rant, the tired eyes of Westerberg as Notting sits down, Notting’s seething rage as he attempts to keep his cool, Henry’s woes turned to pride as he moved from whittling to showing off his software contribution, Samson’s smug smirk as he speaks out against Green Arrow, Domini’s clueless gaze, and my personal favorite, that slightly dazed drunken stupor of the Seahawks fan with the double beer can hat that conveys a whole different level of “stunned” than the rest of the crowd. The transition to the Carlini / Rodriguez / Vazquez art team worked really well; though I’d say their style is less distinct than Schmidt’s, they maintained enough of the stylistic details he’s established for the switch to feel right. And, DAMN, those chase scenes!!! Issue 14 is a series of scrambles, chases, and fights, and the art brought the action to life with a lot of gusto. My only gripe is a long-time hang-up of mine when they over-simplified the faces on a couple of mid-distance frames. Everything else, though, was rock solid. That is everything else except for the timing – that annoying element of comics that falls somewhere between the writer and the artist. The artwork was so dynamic and engaging that it built up a higher pace tempo than the story may have been setting. But the speed at which people -- Oliver, the offensive line, the police, plus however many thousand people Queen Industries Field seats -- were able to get from the field or main floor of the stadium to the top-most hallway (or vice-versa) felt kind of distractingly insane. Necessary for the story, perhaps, but with the art feeling so fast, a little bit of sprinting in the stairwell, or finding an emergency express elevator, would have helped the cohesion of the drama quite a bit. I really appreciated the way Percy and the art teams are handling the use of a real-world football team in a real-world city. Instead of manufacturing a team like the Gotham Knights, they’re using the Seahawks, usually just calling them the Hawks, and obviously avoiding the exact color scheme or showing their logo for what I’m assuming are copyright reasons. But rather than using (and killing or severely injuring) players off the actual roster, the DC Universe has their own roster of players, who conveniently tend to have contrasting skin tones to the real-world player who wears the same number, lest you think there’s any implication that Eleonora Carlini wants to drive an arrow through DeAndre Elliott’s eye. Well, I guess she might. But, y’know, it’s not like she actually put his likeness in the book, right? OK. So let’s see what we have here! 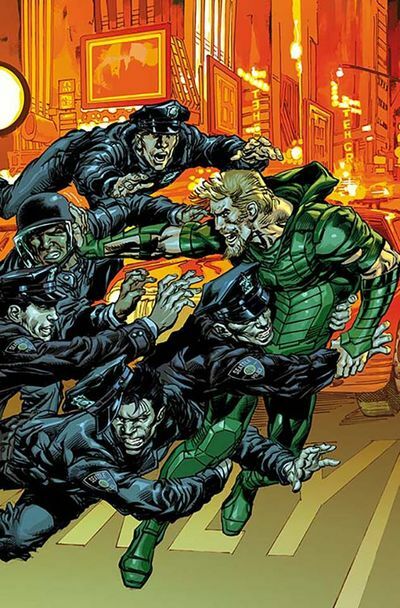 We have Oliver running off his fowl mouth, running from the cops, running from an angry crowd, plus running after the Arrow Killer as things get ig’nant and perhaps a bit hectic! Yeah, I’m going to go ahead and compare these two issues to the Black Eyed Peas’ overplayed pop earworm, Let’s Get It Started. Feel free to mock me, as I know Emiko would. If she were, uh, real. There’s a brief moment in this arc that’s possibly easily overlooked due to it’s remoteness from the more action-packed threads. 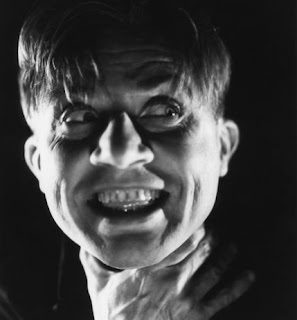 But en route from his baffling attempt at giving a campaign speech to his room full of hookers and blow, Domini has a little Stoker moment -- that's Bram Stoker. This doesn’t appear to be the same Nathan Domini that was carjacked by Oliver, but exactly what is up with him is not yet revealed. Is Domini turning in to R. M. Renfield? As with the primary thread of Emerald Outlaw, there seems to certainly be more to be revealed than the apparent madness on the surface. 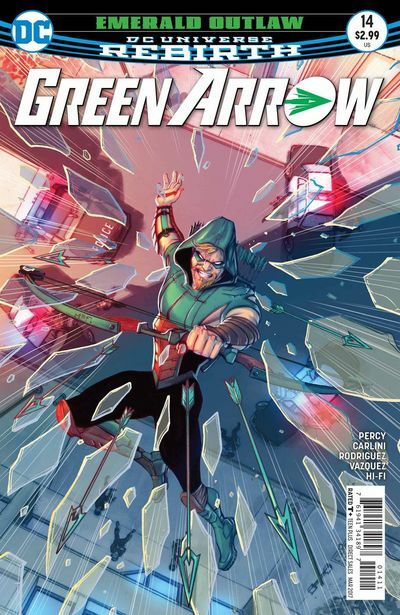 Percy’s Green Arrow continues to be one of my favorite books month after month. He’s building up the cast, not just of rogues, but of allies and gray-area-hangers-on as well. And, for the most part, nobody’s getting permanently set aside. I spy (with my little eye) Emiko’s return based on the cover of issue 17, followed by a three issue arc with Roy starting in 18, and then what looks like Eddie Fyers on 21, with a promise of more of the Ninth Circle in the solicit. Granted, that means we’ll probably be getting yet another retcon of Ollie and Roy’s relationship history, but, hey, I’ve long since forgotten about the inexplicable return of Queen Consolidated when Percy took over the title, let alone the mysterious disappearance of Mia Dearden, so I’m sure I’ll eventually recover from the unavoidable continuity arrhythmia it’ll give me. Does Broderick control the Vice Squad? Is the Arrow Killer’s framing of Oliver personal? Or just Broderick’s bidding? What is the current status of … that other bad guy’s origin? Does Westerberg always do a sweep of the station after an all-hands call? Or was there some other reason he headed back in? If Much lives, will she continue her documentary? What ever happened to the rubber ducky lady who knows Green Arrow’s identity? I want her to weigh in on this good-guy-or-guy thing!